Sometimes it doesn't take much to get an elementary school teacher all excited and twitchy. The coolest item ever in the dollar bin at Target, chocolate at a faculty meeting, no line at the copy machine, THAT kid is absent. But more often than not, it's a book. We get all crazy about our favorite books. I think it comes down to the fact that I can relate to these fabulous little characters. I can identify with Pete because he doesn't sweat the small stuff. Teachers would never make it through the day with a sane thought in our heads if we freaked out over every little thing. That being said, I can really identify with Scaredy Squirrel,too. OCD is too mild a label for him. I can relate. I guess Pete and Scaredy are my yin and yang. Fortunately, there are a million and one things to do with these books and a whole host of skills to teach with them. I usually start the year with Pete since he's so good at teaching that all important "go with the flow" skill. Pete helps me teach social skills, color words, voice, text features, sight words, sequencing, and making connections to name just a few. When October rolls around, it's time for Scaredy Squirrel. He fits nicely with autumn. At the beginning of the year, I try to get those kids to write something - anything. A sentence is often too daunting for many of my friends, so we start with lists, labels, and sequencing. Right up ol' Scaredy Squirrels's alley. 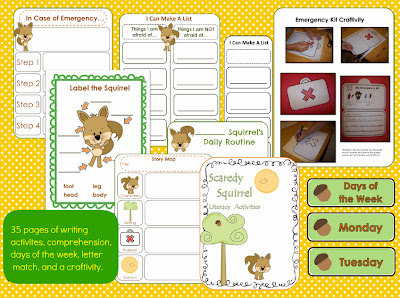 I am spending my summer making some materials for the Scaredy Squirrel books because I just haven't found much out there and, of course, there's no time during the school year to do it! Which leads me to a freebie. 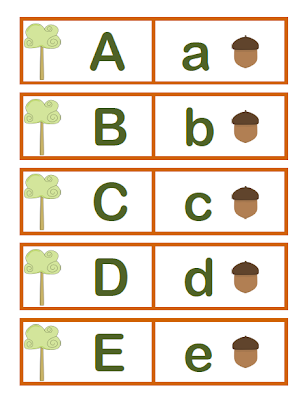 This is an uppercase/lowercase letter match I made for my literacy stations during our Scaredy Squirrel unit. It is part of this larger 35 page writing and comprehension set. Don't forget to check out lots of other fun freebies! Enjoy and have a terrific week! So cute! Wish I was still teaching k or 1. I love Pete! I am still going to use Pete is 2nd grade. Thanks for sharing your great freebies. I'm your newest follower. Thanks for reading - I was hoping someone could benefit from my personal cyber-therapy! And I'm following you, too! I don't know about Scaredy Squirrel so I will have to check him out. Your unit looks great! Oh - you will love Scaredy Squirrel - there are so many lessons in that book! It lends itself to so many different kinds of writing. I love your blog and your ideas!! I just awarded you the Versatile Blog Award. Head to my blog to get your award! How is it that I have never read these books! I must check them out! I love your ideas and am your newest follower. You will love these books - and the sequels! Thanks for following! I love both these book. I just posted about Pet the Cat on my blog too. Love the freebie thanks! I'm your newest follower.